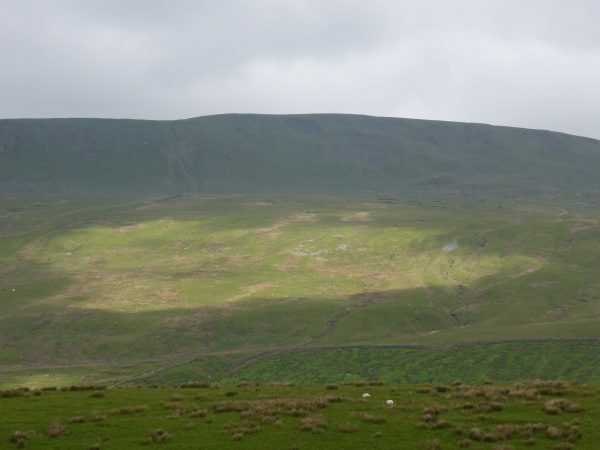 I have walked in the Dales for over thirty years and have been up Whernside three or four times, Pen-y-ghent half a dozen times (the latest yesterday) and Ingleborough well over a dozen times. A couple of years ago Lynnie and I did them all in consecutive days, but I have never done them all in one day. Today is the day to fulfil a long held ambition. 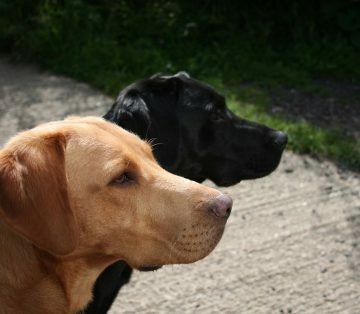 We are up early and the boys get a short walk and breakfast. Then I check that I have everything I need for the day and load Crosby in the car. Dexter looks a bit miffed, I explain that he can come if he wants, but we are off for the day and will be covering 26 miles. He decides that a day at the Unicorn with Lynnie sounds far more preferable. We clock in at the Café at 8.15 and then make a start. 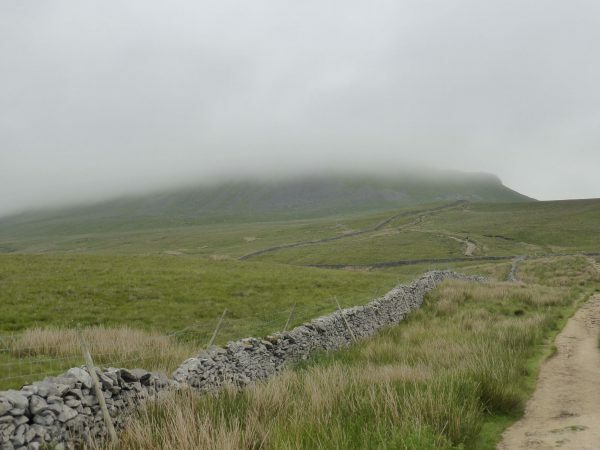 Pen-y-ghent is shrouded in cloud and it is pleasantly cool as I start the ascent. I am on the route that Lynnie and I took yesterday, just going a bit quicker. As I go over Brackenbottom Scar I see a walker ahead and gradually gain ground. Finally we meet and I realise that it is one of the chaps who was working on the path at the top of Pen-y-ghent yesterday. He is working on his own today and is enjoying his commute to work. We walk and talk for ten minutes and then I go on. Clambering up the rock face I am reassured that I am not near the top of this peak on my own. Due to my fear of heights it is the one bit of the walk that I dislike. On the other hand Crosby is up and over and looking back wondering what is keeping me. I tell him that he is in four-wheel drive and I stuck with rear wheel drive and not designed for this type of terrain. At the peak, 2,277 feet, it feels very different than yesterday. Visibility is poor, less than fifty yards. You can see how under prepared folk can get into difficulty up here. As we descend the visibility improves and we are treated to views of Ingleborough and Whernside, both cloud covered. Yesterday Lynnie and I took the Pennine Way path down into Horton, but today it is straight on for me, over Whitber Hill. As we have been descending Crosby has been treated to an apple core, Pringles and cheese biscuits found on the wayside. Whitber Hill provides Hoolahoops. Somewhere up ahead must be a group of youngsters. Then around Jackdaw Hill, I start to get gyp in my left boot. I can hardly believe it, all the walking I do and I get a blister just over six miles into a twenty-six mile walk. Being a good Boy Scout (although I never went to the Scouts) I am prepared. A plaster is applied and we are on our way. Thousands of people do this walk every year, so the path can be clearly seen and although I am carrying a map there is no need to refer to it. I can now see the group of youngsters ahead and I am closing on them. Over God’s Bridge on Brow Gill and around Nether Lodge and I overtake the youngsters, about eight of them in their late teens and a couple of older chaps. They are as busy talking as walking. As I approach Thorns I hear steps coming behind me and turn to see that one of the students is catching me up. He asks if I mind him walking with me for a while. We walk together for thirty to forty minutes, he tells me about his College course in Leeds, I tell him about our travel. We chat about the beauty of walking and we both wonder why more young people don’t want to get out and about. We are from very different backgrounds and ages. He is a young chap of Asian descent. 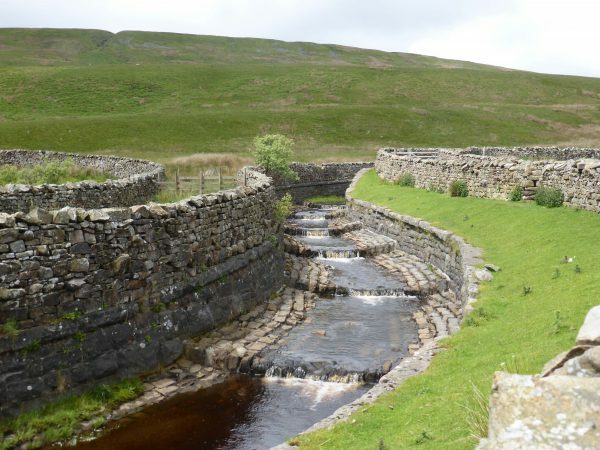 We share a common interest and he appears fascinated when Ribblehead Viaduct comes into view and I tell him about the construction and the mass grave at Chapel-le-Dale churchyard. At Ribblehead he rejoins others from his group. I hope he enjoyed our chat as much as I did. 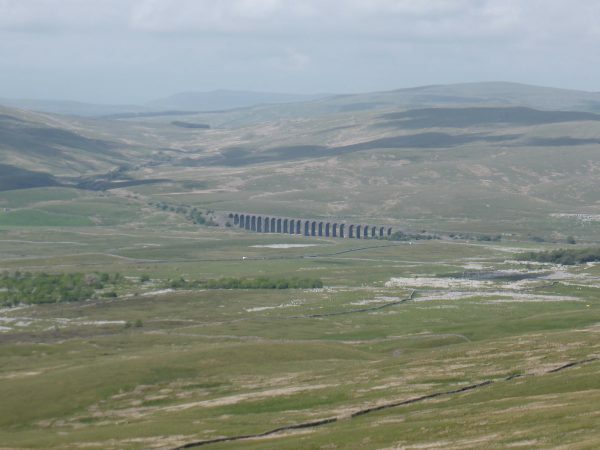 Ribblehead Viaduct is an iconic feature of the Dales. It looks fantastic in photographs but in real life it is absolutely stunning. It’s an incredible feat of engineering. The Viaduct is 440 yards long with twenty-four arches that carry the Settle to Carlisle railway one hundred feet above Batty Moss. The viaduct itself is a Grade II* listed building and the areas where the navvy settlements of Batty Wife Hole, Sebastopol and Belgravia were located are scheduled ancient monuments. The first stone of the viaduct was laid on 12 October 1870 and the last in 1874. About one thousand navvies worked on the site and they established shantytowns in which men, woman and children lived. It must have been a bleak existence, especially in the hard winter months. This place is miles from anywhere. Around one hundred men where killed in the construction, no health and safety in those days. There was also a smallpox epidemic that claimed the lives of other men, women and children. In all, over two hundred people were buried in Chapel-le-Dale churchyard a few miles down the valley. Today the area has groups of walkers about and others that have just stopped to wonder at this incredible sight. Heading on I walk alongside the viaduct and follow the path by the Settle to Carlisle railway line, passing Blea Moor Signal box. I can see a few walkers in the distance but apart from that I am alone on this approach to Whernside. Crossing the aqueduct, another wonderful bit of engineering where the stream is diverted above the railway line, we quickly reach Force Gill waterfall. Then over a stile, I chat to a couple having a drink, she tells me that she is dreading the scramble up to Ingleborough. I am not so keen on this part myself, but it is a couple of hours away and I want to enjoy the moment. The walk up Whernside from this side is a long gradual ascent. Soon we are looking down onto Greensett Tarn, the mass of water looks strangely out of place on this moorland and then it is the final section to the top of Whernside. I am not over keen on the drop to my left at the top, but keeping focused I am okay. 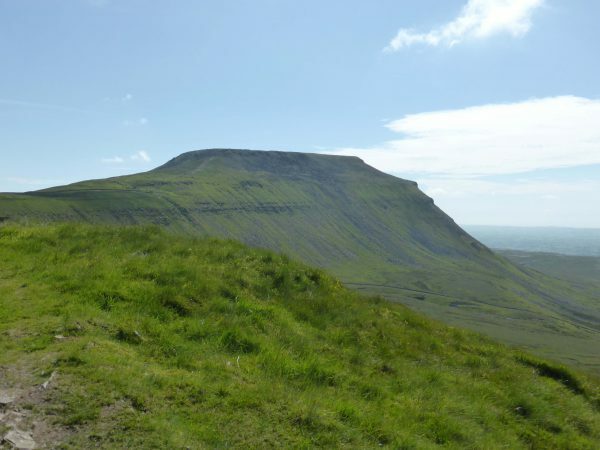 Whernside is the highest of the three peaks, although the easiest to climb, it stands at 2,415 feet and provides fantastic views back across Pen-y-Ghent on to Ingleborough and across towards Dent. As I start the descent I pair up with a chap who has done this walk a number of times. We discuss the merits of walking boots, leather or canvas? 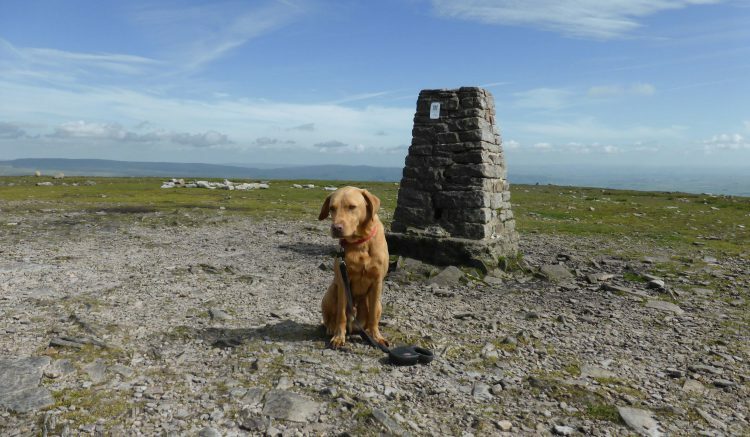 He explains he has done the walk both ways round but prefers this way, especially the scramble up Ingleborough. I can now see it directly in front of us and ask how steep it is. I am told that it a short climb but very steep. I explain that I don’t like heights. “Oh dear” he replies, followed by a quick “but I am sure you will be okay”. I am not so sure. The final descent from Whernside is steep. I leave my new walking buddy behind. The first time I hiked up Whernside was from this direction, it is a bit of a clamber. My first ascent, over twenty years ago, was an early evening in late August the cloud suddenly came down and visibility dropped dramatically. It was pretty scary. Today visibility is fantastic, but I still need to be sure footed as we descend. Mr Crosby thinks its great fun to charge on ahead at the full limit of his extendable lead. We have words and he stays closer. We reach Bruntscar and find a convenient rock to sit and have a drink. Soon my new buddy appears around the corner and goes on ahead, a relief because I think I have exhausted by walking equipment conversation. I check the map and realise there is an alternative route up Ingleborough, it is still steep but does not appear to have the final scramble. Somewhat relieved we set off again. We meet the road at the Hill Inn and turn left along the road for a few hundred yards and then right into a field. There sat on the rock is my mate. We have a brief chat and I tell him that I am going to Ingleborough by the route that avoids the steep scramble. He gives a slightly bemused look, “that’s the best bit of the walk” he says. I take the footpath but after a couple of fields turn left to walk up to Great Douk Cave. I have not previously heard of this cave, it is surrounded by a dry stone wall and is shielded by trees, it is a huge hole. A little further on I round Little Douk Pot and then cross boggy ground to the limestone crag containing Middle Washford caves. So far it has been a gradual incline. Suddenly we are going up. I would like to say that I was stopping every fifty yards to admire the view, in reality I was catching my breath. This is a climb, but eventually we arrive on the ridge and the views are magnificent. From here you can see back over Morecambe Bay forty miles away and of course the Ribblehead Viaduct. Walking along the ridge I glance back over the steep incline that is the preferred route up. I am sure that I could have come that way, but glad I opted for the route around Great Douk. 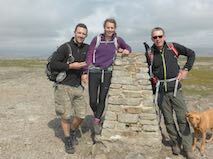 Then it is the final climb, over big rocks and suddenly onto the rocky top of Ingleborough. This is one of my favourite places in the world. You can see so much and no matter which way you come up there is always a real sense of achievement in getting here. I have been walking up Ingleborough for years. Ben and I walked up here when he was six. On that day Lyn and Lolly stayed behind. Mum had come to Yorkshire and was staying with her good friends Phyl and Maurice. As Ben and I left we were instructed to wave to Mum and Phyl when we reached the top. On every subsequent trip, Phyl always said I should wave to her from the top. Sadly neither Mum nor Phyl are still with us, both are greatly missed. As I reach the summit I wave to them both. Now I will leave you to decide if it was the strong wind that was making my eyes water, or if I am just an emotional chap. I will give you a clue, I cannot watch Mary Poppins without crying when the wind changes direction. Crosby and I have a quick cuddle to celebrate our third peak of the day, this one is 2,372 feet. Our route down to Horton means that we have to retrace our steps off the summit. As we do we meet my walking buddy coming up, we bid each other the final farewell of the day and I continue down. It is a long gradual descent to Horton with Pen-y-Gent directly in front of us. Usually walking this path I admire the view, but today the focus is getting to the bottom. As I enter Horton I see the Leeds College mini-bus, there in the front seat is my young mate from earlier. He tells me that he had to stop after Whernside, there are four or five other young chaps in the van. It goes to show that not everyone who starts this walk finishes and that adds to the sense of achievement. I was feeling a bit disappointed that I was going to be outside my target time of 9.5 hours. However, I would rather be ten minutes over than not complete. Clocking back in at the Café, I have covered the twenty-six miles in nine hours and forty minutes. Well inside the twelve hours allowed to become entitled to join the three peaks club. Crosby and I get back to the Unicorn to a warm welcome. Dexter look at me as if to say “Where the hell have you been all day with Crosby?” Then gives Crosby a look saying “Serves you right for stealing my Dad”. Time for a shower and a couple of beers. It would be a struggle for me to walk 26 miles in 9 hrs let alone up & down hills.